I was really upset when I read this article from Consumer Reports – Five products not to buy for your baby! Along with Baby bath seats, Crib bumper pads and Sleep positioners were listed two products near and dear to advocates of attachment parenting: Co-sleepers and Slings! Although sleeping with a baby in an adult bed is a common practice among some cultures, it can be dangerous. The new bassinet-like devices designed to go in between parents or alongside an adult bed don’t necessarily make co-sleeping with a baby safer… Currently, safety standards don’t exist for either co-sleepers or bedside sleepers. Until they do, we think the safest place for your baby to sleep is in a crib. Over the past five years, at least four babies died and there have been many reports of serious injury associated with the use of sling-type carriers. The incidents include skull fractures, head injuries, contusions and abrasions. Most occurred when the child fell out of the sling. As slings grow in popularity, so do the number of serious injuries. No safety standards exist for slings. We think you should skip the sling and opt for other types of infant carriers, which have safer track records. ….Sure you can point out the negatives of these few items… but how many babies have died in cribs? How many cribs have been recalled? It’s not just co-sleepers. How many babies have been injured or died from falling from their parents arms or being left on the changing tables? ….it seems to me that the common thread in all of these “dangerous” products is a lack of education and care on the part of the parent. …Talk about throwing the baby out with the bathwater! …and no response from Consumer Reports. Since I spent hours and hours researching products on this site prior to purchasing my baby gear, I’m disappointed to say the least! These kinds of ‘studies’ do not provide controls. Like you said–how many deaths from slings are there compared to just dropping the baby or the baby falling from couches, etc. Also, cribs are not just recalled–crib mattresses are extrememly toxic! These ‘studies’ only cause fear and discourage parents from making healthy and personal choices like co-sleeping and attachment parenting, which we all know are healthy. The long term effects are really what are important. Veggiemom – I agree. It’s disappointing that Consumer reports would come out against these products since they tend to be well respected. I totally agree. Very disappointing. Sort of like throwing the baby out with the bathwater. I am sad to hear Consumer Reports publishing something like this without proper comparisons to crib and carry / typical carrier injuries. I agree with the other posts that it shows poor research and reporting on their part. I am still setback sometimes by the shocked responses I get to my girls co-sleeping with me and my husband (Cali king finally). It wasn’t a parenting decision for us, it just felt right to know they were right here. It saved my youngest daughters life one night. She was choking and not making a sound, she was hitting the bed, something I woudn’t have picked up on a baby monitor… so they can include my Emmerson as one life saved by co-sleeping. I think they should also realize that no matter how safe a product is deemed it is typically parental error that causes these injuries. I see moms carrying babies in slings all of the time and you can tell they didn’t read the instructions of proper positioning. Just like the bumbo and bebe pods, how can they be dangerous but then they were recalled because parents were leaving their children on counter tops in them when they specify floor only. How insulting to imply that parents can’t use their own judgment to determine a product’s safety! I doubt anyone is more concerned about my children’s safety than I am, regardless of whether a government body has stamped their approval on my baby carrier. You have to trust parents to have the best interests of their kids at heart, and to exercise their good judgment in parenting. If you don’t, what are you doing leaving us alone with these kids in the first place? 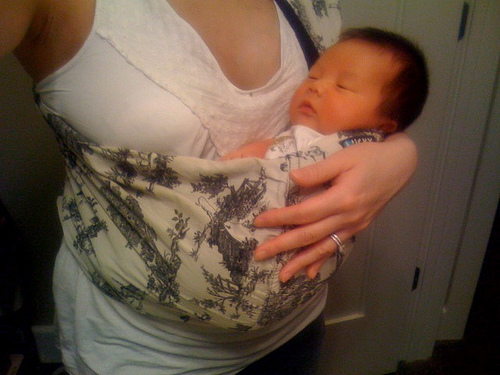 Slings can be very tricky to use at first. Sure, they come with directions but I personally had difficulty trying to tie my Moby Wrap just based on the little pamphlet. Really the most useful thing was getting help from experienced moms through the local chapter of Babywearing Intl. Are antibiotics making our families fat?